If everyone looked at Italian Renaissance Art through the eyes of video-artist Bill Viola, art history, and Renaissance art history in particular, would, I imagine, undergo a… Renaissance. The retrospective exhibition at Florence’s Palazzo Strozzi, “Bill Viola, Electronic Renaissance” (March 10 to July 23, 2017) for the first time puts the American’s video installations in direct comparison with the Florentine and Tuscan works of art that inspired him. Through contemporary medium infused in past aesthetic, Viola reinterprets the Renaissance by reminding us of the universal themes depicted in this period’s art, like life and death. 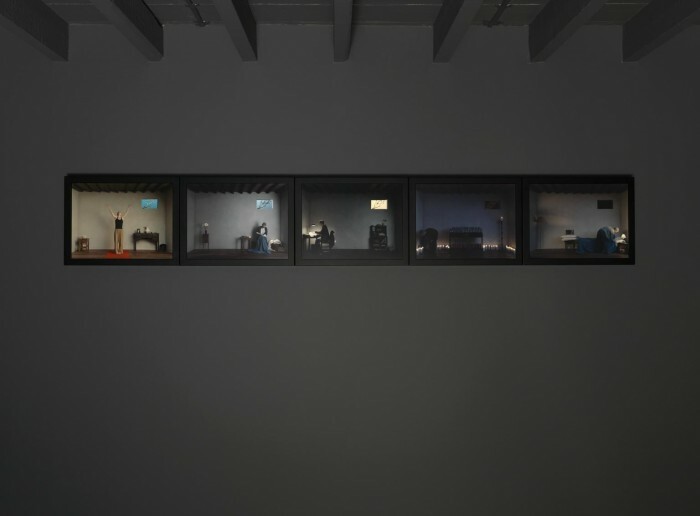 The exhibit, which could not possibly find a more suitable home than this, also presents an evolution of video art that retraces Viola’s career and video technology more generally, making this an opportunity to become acquainted with this oft-difficult medium. Exhibition display of Paolo Uccello’s Deluge (SMN) with Bill Viola’s The Deluge (Going Forth By Day) 2002 at Palazzo Strozzi, Florence. Soon after Bill Viola graduated from the arts department of Syracuse University (my MA alma mater), where he was able to use the most sophisticated video and sound technology of the time, he came to Florence for a year and a half to work as technical director in the experimental gallery art/tapes/22. It was 1974. He’d come from a training that emphasized form over content, that rejected historical art as being too infused in “questionable religious dogma, irrelevant for the contemporary world” (Catalogue, Italian edition, my transl., p. 139). 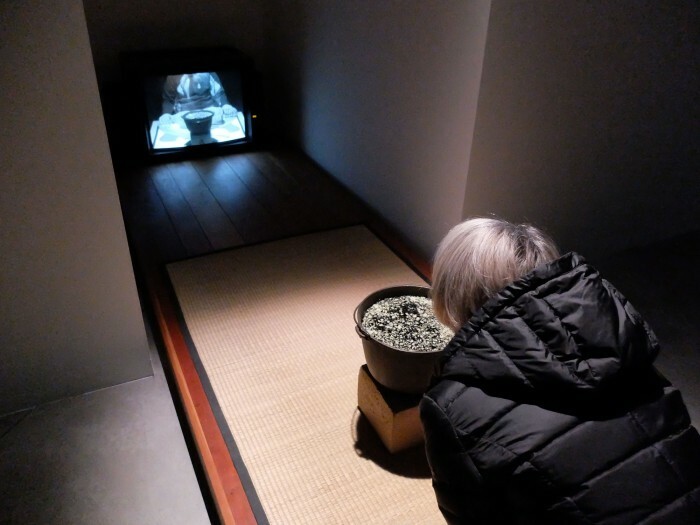 What’s ironic is that, in video art, the technology of the 1970s wasn’t really sufficient to communicate said “form” – as some of Viola’s early works in the Strozzina section of this exhibition demonstrate – while the concept or content would be quite philosophically appealing. Perhaps the most interesting early work on display at the Strozzina is the interactive Eclipse/Vapor which projects the viewer on the screen as she inhales the Eucalyptus vapor on the mat. In the midst of all this abstraction, Viola found himself “in” with the major players of the contemporary art scene of 1970s Florence: Superstudio and Archizoom, UFO and Gruppo 9999. Experimental was the word of the day. At the same time, the American found himself in Florence for the first time, and I imagine him wandering around like any arts-attuned American tourist might. Eyes and ears wide open – he did a lot of sound recordings, more so than photos and videos at this time – he explored the city. Viola observed how the city’s great art was incorporated into churches and public spaces, making it a physical experience that brought him to realize the true reason for art. “I had my first unconscious experiences of art connected with the body, because many of the works of that era… are simply a form of installation: a physical, spatial experience for total consumption,” reflects the artist in 1992. This is the moment he realized that sensory and visceral experience was his medium. Ironically, while Florence often uses the Renaissance as a major limitation to its being able to make progress in the contemporary arts, the city seems to inspire plenty of stranieri. This isn’t the first and only time that contemporary art is inspired by Florentine greats. Victor Coonin amply demonstrates the impact that Michelangelo’s David has had on many contemporary artists in his book From Marble to Flesh. But Viola wasn’t looking at the most iconic works of this period. For him, it’s Mannerism more than High Renaissance. 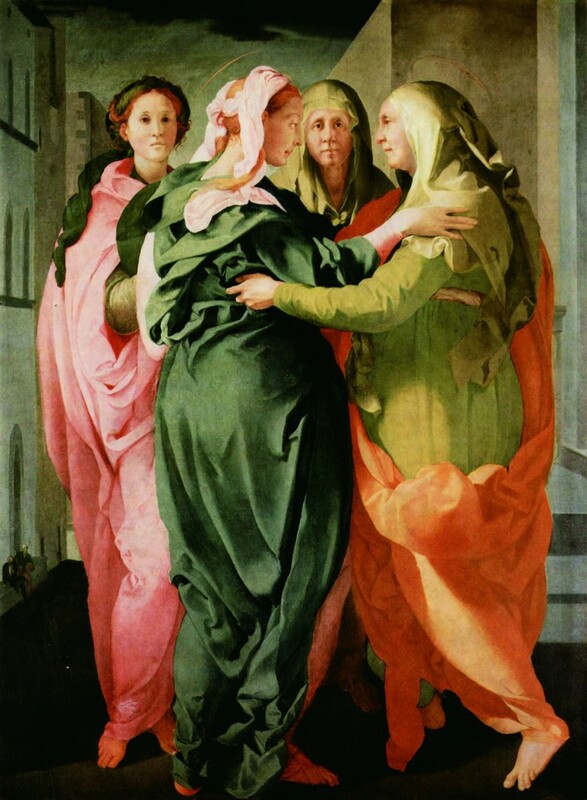 He was particularly inspired by Pontormo – not by the Carmignano Visitation that he didn’t “meet” until later in life, but by the Deposition in the Capponi Chapel in Florence’s Church of Santa Trinità. “I was struck by the colors… I wondered what the painter had smoked to come up with that pink, those incredible blues. It looks like he worked under the effect of LSD,” observed Viola in 2014 about his 1970s experience (Catalogue, Italian edition, my transl., p. 22). 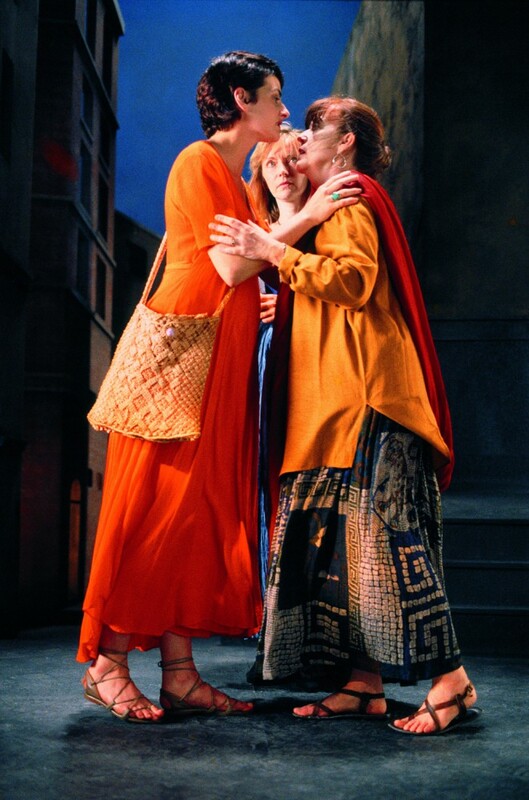 In The Greeting of 1995, Viola recreates the composition of the Visitation in a scene that barely differs from the historic one (with one less character). A 45-second encounter between two pregnant women is shown in extreme slow motion over 10 minutes, on a vertical screen that mimics the Pontormo. The colours are vivid in a way that only modern high definition video or brilliant oil painting can render. While we may spend just a few seconds looking at a painting in a museum, Viola forces us to watch his piece for at least a few minutes to see the action carried out, an action that is encapsulated, frozen, in the earlier work. This is the time we need to let our eyes wander around the composition, to reflect upon meaning and the visual. The immersive power of frescoes and the multi-panel narrative they incorporate also inspired Viola, who observes the cinematographic style of Giotto (something one of my favourite professors at Syracuse, Rab Hatfield, always talked about). “The fresco cycles read like a sort of large-scale storyboard,” declares Viola (Catalogue, Italian edition, my transl., p.142). 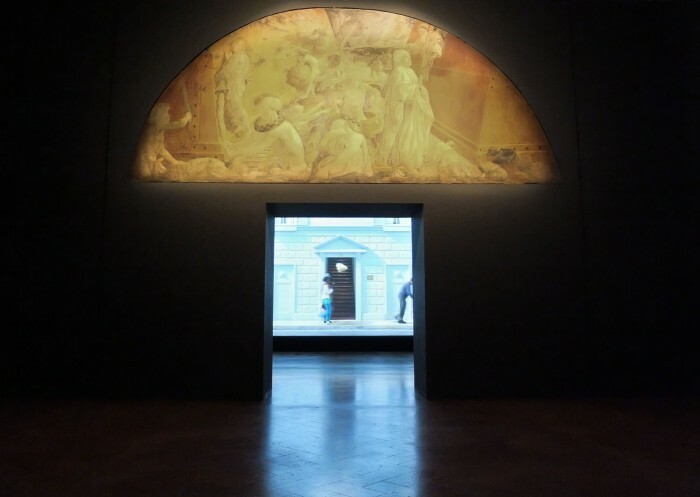 Catherine’s Room is a colour video polyptych from 2001, shown in the exhibition near a predella-like panel by Andrea di Bartolo from the 1390s. Viola admits that he spent a month in Siena and didn’t much like or understand that city’s art at the time, but that something attracted him to it (p. 142). The five scenes of Catherine’s Room take place in a cut-away room like the delicious houses in which Taddeo Gaddi liked to tell his stories. A woman slowly and deliberately moves through this space. Like 14th and 15th century narrative, very few objects are present, but they instantly tell a story, and that story is helped along by what we see outside a window. We immediately read four seasons out the window, and we see that the woman is in four stages of life. Used to seeing repetitions of four in art, my heart stopped in grief as I read the fifth. Outside the window, it is black. The woman is making up a bed, placing numerous pillows there. Placing a blue… shroud on it. Like a medieval narrative, the work asks us to read symbols and gestures and to meditate not only on the subject pictured but on the larger questions of life and death. 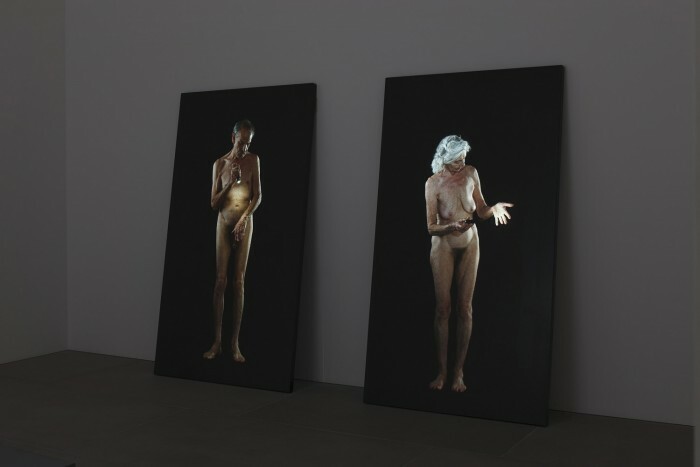 Similar questions of life, death and eternity are present in the 2013 work Man Searching for Immortality / Woman Searching for Eternity which shows an elderly man and woman naked, starkly lit against an all black background. With a flashlight in their hands, they examine their bodies for traces of disease or corruption. This is visually paralleled to Cranach’s Adam and Eve on loan from the Uffizi. The exhibit, and perhaps video art at its best, is about Time. Time and reflection are required to experience this exhibition. Despite the difficult themes presented, I felt relaxed after spending an hour inside Palazzo Strozzi, slowly considering each work (works that most often use slow motion). It’s a sensation that makes me think of the comfort that the past religious paintings must have brought to their viewers. It’s a feeling that I get when I take the time, so rarely these days, to sit and think in one of Florence’s great churches… without looking at my smartphone, maybe in the off-season, without tourists around… It takes me back to my first encounters with the city and with its art – when nothing else seemed more important than me being in that place, at that time – and, by proxy, to Bill Viola’s reflexive journey as well. Viola reminds me how to look at Renaissance Art.